Disclaimer: I’m cheering for the Steelers in Super Bowl XLV (that has a little to do with why Tomlin is our spotlight today). 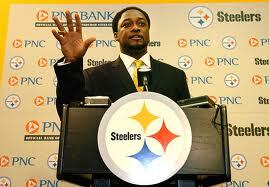 Mike Tomlin was born March 15, 1972 and is the current head coach for the Pittsburgh Steelers. Tomlin is the third youngest head coach in any of the four major North American professional sports. He is the tenth African-American head coach in NFL history, and first in Steelers history. With the Steelers’ victory in Super Bowl XLIII on February 1, 2009, Tomlin became the youngest head coach to lead his team to a Super Bowl victory – that’s the history angle and why he’s really in this spotlight series. Tomlin attended Denbigh High School and was a three-year starter as a wide receiver/tight end for the College of William and Mary, where he became a member of Kappa Alpha Psi Fraternity, Inc. He finished his career with a school-record 20 touchdown catches. He was a second-team All-Yankee Conference selection in 1994. Tomlin never played in the NFL. Tomlin’s coaching career began in 1995 as the wide receiver coach at Virginia Military Institute under current West Virginia University head coach Bill Stewart. He spent the 1996 season as a graduate assistant at the University of Memphis, where he worked with the defensive backs and special teams. Following a brief stint on the University of Tennessee at Martin‘s coaching staff, Tomlin was hired by Arkansas State University in 1997 to coach its defensive backs. Tomlin stayed there for two seasons, before being hired as defensive backs coach by the University of Cincinnati. Tomlin was hired as the defensive backs coach for the Tampa Bay Buccaneers in 2001. In 2002 and 2005, the Buccaneers led the NFL in total defense (fewest yards allowed per game)—during Tomlin’s tenure, the defense never ranked worse than sixth overall. When the Buccaneers won Super Bowl XXXVII in January 2003, the team recorded five interceptions, three of which were returned for touchdowns. Tomlin was selected by Vikings’ head coach Brad Childress to be his defensive coordinator in 2006. Two of the players on the Vikings were older than Tomlin, and Tomlin had been a teammate of Vikings’ safety Darren Sharper at William and Mary. The 2006 Vikings finished with the NFL’s eighth-best overall defense, but had the unusual distinction of finishing as the top-ranked defense against the run and the worst-ranked defense against the pass. Tomlin became the sixteenth Steelers head coach on January 22, 2007, when he was hired to replace Bill Cowher, who resigned after spending 15 years with the team.